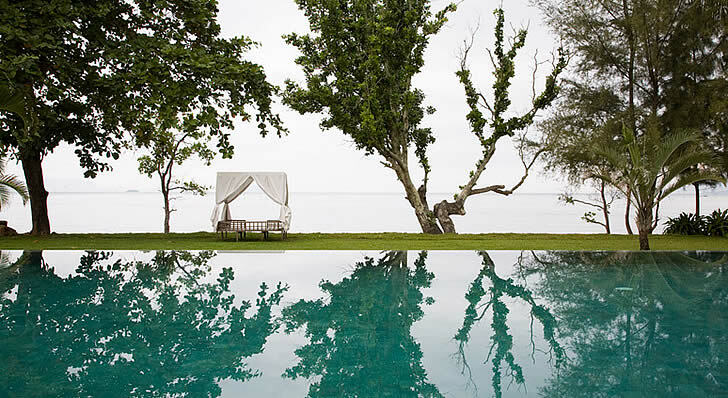 Hidden down a small road in the tiny town of Kep lies what is arguably Cambodia�s most beautiful hotel. Bridget McNulty uncovers the beauty. After travelling through Cambodia for a month, we thought we�d seen it all. Big hotels, small hotels, hotels in the middle of nature and those on bustling city streets. Traditional hotels, modern hotels, and something in between. But we hadn�t seen anything like Knai Bang Chatt. This is probably because there isn�t anything else like Knai Bang Chatt. Built between 1962 and 1965 by three different architectural prot�g�s of Vann Molyvann, himself greatly influenced by Le Corbusier, the hotel initially consisted of three separate villas (one of which belonged to the governor of Kep, the other which was owned by a relative of the King). 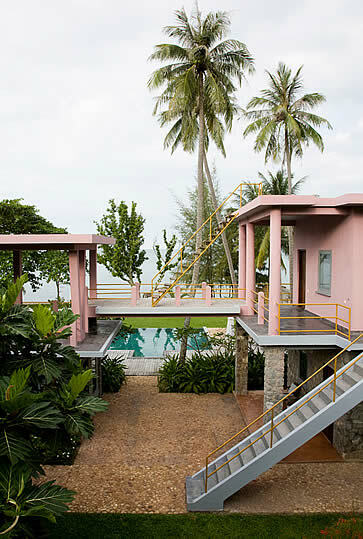 The villas were abandoned in 1970 and remained so during the Khmer Rouge years, right up until 2003, when Jef Moons and Boris Vervoordt, holidaying from Belgium, decided to buy the villas, have them restored, and open a hotel. 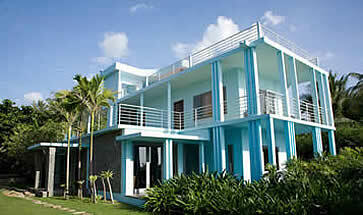 They needed a further building to make it financially viable, however, and so five years ago a fourth villa was built. I challenge you to figure out which is the most recent building � they all blend together so perfectly. Although, perhaps that�s not the point. The unusually blocky shapes, open roofs and curiously placed staircases of the villas don�t lend themselves to blending in. Nor does the recent paint job � each of the four villas boasts a new coat of pastel paint, one pale blue, one baby pink, one grey and one light yellow. It should be cheesy or jarring, but somehow it works. Believe it or not, the Easter-egg coloured villas actually bring out the beauty of the 180-degree view of the ocean and the lush green of the sweeping lawn. Of course, this could also be because the hotel as a whole is so understated and tasteful. 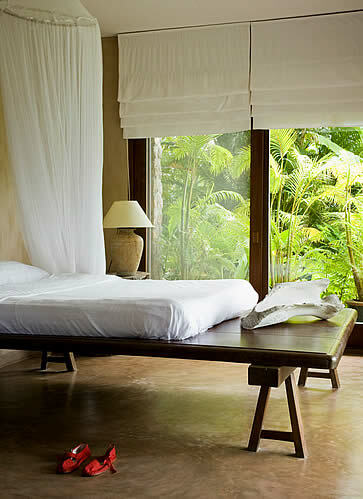 Polished coffee cement floors, rough pottery lamps and large wooden tables adorn an otherwise empty room � save for a large bed on a wooden platform, made up in plain white linen with a hanging mosquito net. Instead of side tables, there are sections of logs, and the main decoration is a large bleached whale bone on the end of the bed. No pictures, no TV, no unnecessary decorations, and yet it�s beautiful. Stunningly beautiful. The bathrooms are similarly spare, the dressing room is a series of open wooden shelves, and the only hints of colour come through the windows from the garden outside, and from the single lotus in a brown pottery vase, accented by a few green leaves. The absence of decoration allows the warmth of the natural tones and the wood to speak for themselves. Scattered around the hotel you�ll also find charming pieces of antique-looking wood and pottery, placed seemingly haphazardly at the end of the breakfast table (a long slab of wood which looks as if it has been chopped straight out of a tree), or next to the pool, on the grey bleached wooden deck. 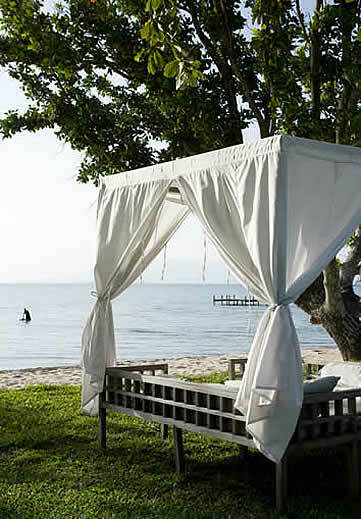 It�s these small, seemingly offhand touches that give Knai Bang Chatt so much character, along with the emphasis on the view � all loungers, tables, chairs and day beds point out to the ocean. 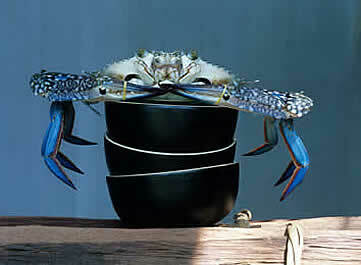 Granted, it�s an ocean worth looking at. In fact, breakfast at Knai Bang Chatt may go down as one of my favourite breakfast spots ever, not so much for the deliciously fresh croissants and fresh fruit platters, as because it is eaten either at the wooden plank table (which is perhaps a little too large to be comfortable) or at a small wooden table on a small wooden deck, as close to the ocean as you can get without being in it. Starting the day off with a view like that is a pretty unforgettable way to begin any day. Regrettably, the service doesn�t quite live up to the architectural and natural beauty. The staff are all extremely friendly and polite, but they haven�t been trained to a five-star level. At the breakfast buffet, we ran out of coffee, fruit salad, butter and knives, and had to remind the staff to replenish the supplies. We were given a welcoming letter on arrival, which told us that the traditional kramas (Cambodian scarves) on our bed were a complimentary welcoming gift � but the kramas were nowhere to be found, and we left without ever seeing one. Not a problem if we hadn�t been told about it, but once the expectation is there, it�s a let-down when it isn�t met. For a change of pace (although unfortunately still slow service) head for the Sailing Club, Knai Bang Chatt�s next-door-neighbour, open to the public and serving a lighter menu of mainly seafood and snack food (the hotel restaurant offers decadent three-course meals for lunch and dinner). 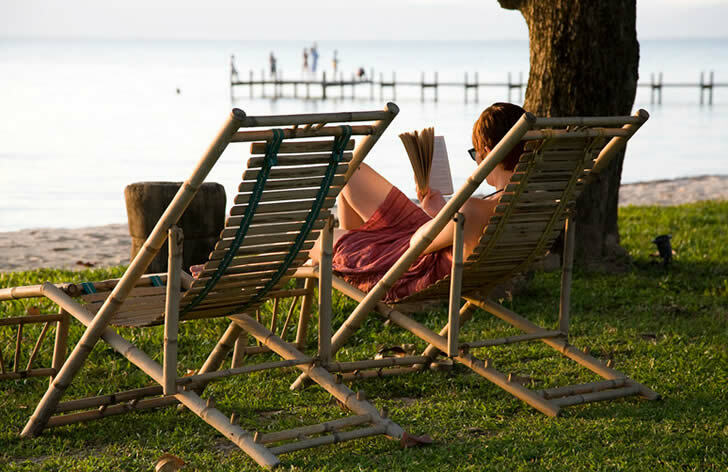 You can also hire a catamaran or a kayak from the Sailing Club, and you�ll be hard-pressed to find a more suitable spot for sundowners (the wooden pier stretching out into the sea will doubtless feature in many a holiday scrapbook for years to come). But it�s Knai Bang Chatt itself that stole our hearts. The architecture, the ever-friendly staff, the infinity pool that begs you to spend a whole day in it, and, of course, That View, will win you over. 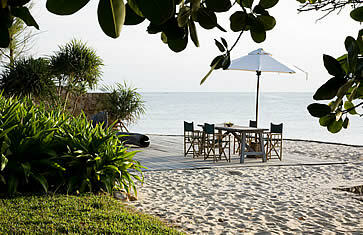 It won�t be too hard to believe that you�ve somehow managed to uncover the most beautiful hotel in Cambodia. Why not take a stroll? A five-minute walk from Knai Bang Chatt you�ll come across a string of seafood restaurants. Keep walking and you�ll be on the path to Kep Beach � a stunning paved road that winds along the seafront for over a kilometre. The perfect place for a late afternoon stroll, as the sun begins to set. Style The famous architect Le Corbusier had a well-known Khmer pupil Vann Molyvann, who had a few less famous, but nonetheless extremely talented architecture prot�g�s. Three of these prot�g�s built the villas that today house Knai Bang Chatt, and the style is unlike anything else in Cambodia � pastel-coloured blocks that somehow enhance the surrounding natural beauty. 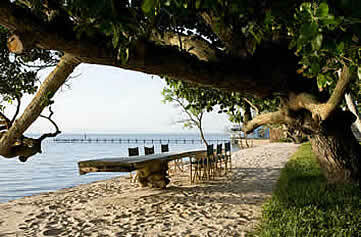 Setting A large grassy garden right on the edge of the ocean, with nothing but sea views in front of you. Simply stunning. Why you'll love it Every effort has been made to make guests feel at home and, unusually for a hotel, it actually works. Because of the way the hotel is laid out � four separate buildings looking out onto the large garden and dining pavilion � the communal space actually feels communal. As the sun sets over the sea, guests gather and choose a seat to watch the spectacle, drinks in hand. A great way to end the day. Good to know The restaurant and pool are for in-house guests only, ensuring absolute luxury and peacefulness. Free high-speed wireless is available throughout the resort, but if you left your laptop at home there�s a small library with a computer for public use. A continental buffet breakfast is included in the room rate. Wow factor The location will take your breath away. No matter how many times you look out at the horizon of ocean framed by palm trees, it doesn�t get any less spectacular. Best rooms or suites to book There are only 11 rooms at Knai Bang Chatt, only one of them single, and one twin (which is apparently much smaller than the doubles). Each room is personalized and slightly different, but the most popular is number 4, upstairs in the Blue House, because of its incredible sea view. The most popular choice for families is the two adjoining rooms upstairs in the Yellow House, one double and one twin. Room for improvement The decision to keep telephones and TVs out of the bedrooms is refreshingly minimalist, and suits the peacefulness of the hotel. But not having mini-bar fridges or tea and coffee making facilities just feels like an oversight. No phone also means no room service, so if you need a mid-afternoon caffeine fix, you have to walk over to the restaurant for it. Not ideal in a hotel of this calibre. The service also needs to be brought up to par, a fact the management seems well aware of. Rates Although all the rooms are roughly the same size, they are grouped according to view. Garden view rooms are US$200 per night (including breakfast), and sea view rooms are US$350 per night (including breakfast). How to Get There Fly into Phnom Penh International Airport. Kep is three hours in a private taxi from Phnom Penh, a trip that should cost about US$50.